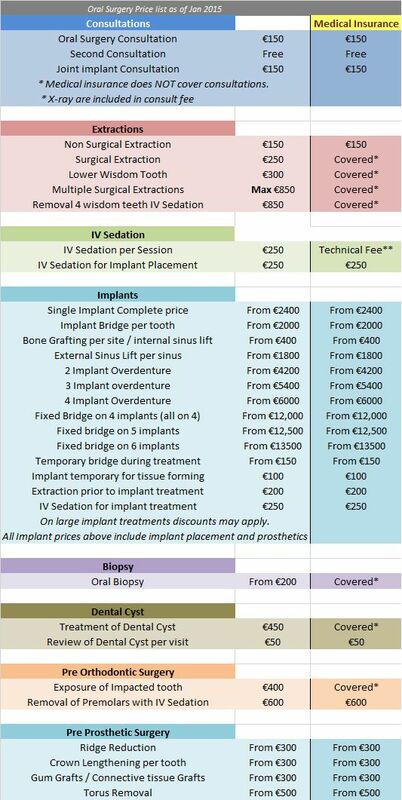 Most oral surgery fees are tax deductible at 20%. ** Technical Fee may apply for IV Sedation during covered procedures. Medical insurance will pay for a covered procedure provided you are insured for over 6 months & that this is not a pre-existing condition. It is your responsibility to inform us if you are not insured for a sufficient time. If your insurance company declines to pay on your behalf for whatever reason then you are liable for the private fees. Coverage for dental implants is only available on a pre-approval basis and certain circumstances. We will advise you at the consultation. Prior to consultation we cannot determine your insurance coverage for a procedure.